Every interaction with prospects and customers is an opportunity to delight and inform. Content plays one of the biggest roles in creating outstanding customer experiences. Connecting customer and content can be a challenge. All organizations, whether B2C or B2B, should develop customer journeys with the intent of building a relationship with the customer. Doing so will allow you to leverage these journeys within your content planning and creation processes. Join me, Scott Abel, The Content Wrangler, and my guests, Adam Helweh and Kevin P. Nichols for this free, one-hour webinar designed to describe and define the modern customer journey and explore the role content plays in fueling how prospects and customers interact with your brand at each stage. Attendees will learn what a modern customer journey actually looks like; why relying on a linear or funnel approach isn't as helpful as you might think and what is the impact of providing the right content at the right time to prospects and customers alike. 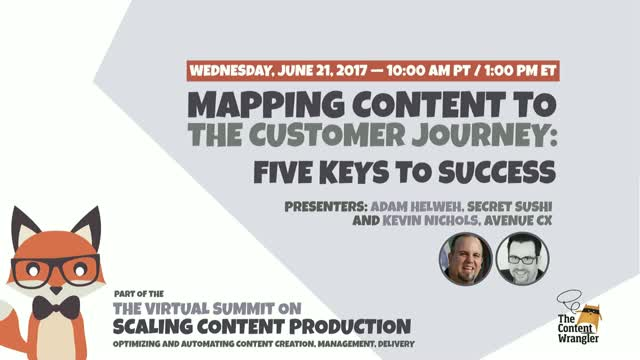 In addition, Adam and Kevin will talk about the role content plays in shaping customer experience, how to use a customer journey map for effective content planning and creation, and what you need to create a customer-journey content map. Adam Helweh is the CEO and founder of Secret Sushi Creative. He specializes in and is deeply passionate about, the convergence of design, social and technology to provide businesses with more intelligent and human ways to connect with customers to grow sales. Kevin P. Nichols is an award-winning thought leader, digital industry enthusiast, and author with more than twenty-two years of professional experience. As a team leader at SapientNitro Kevin grew of one of the oldest global content strategy teams into one of the largest and most successful in the world. Currently, Kevin is Executive Director of Experience at AvenueCX, a consultancy specializing in enterprise content strategy.